Maker Corps could not be implemented successfully without the commitment and participation of its partners. 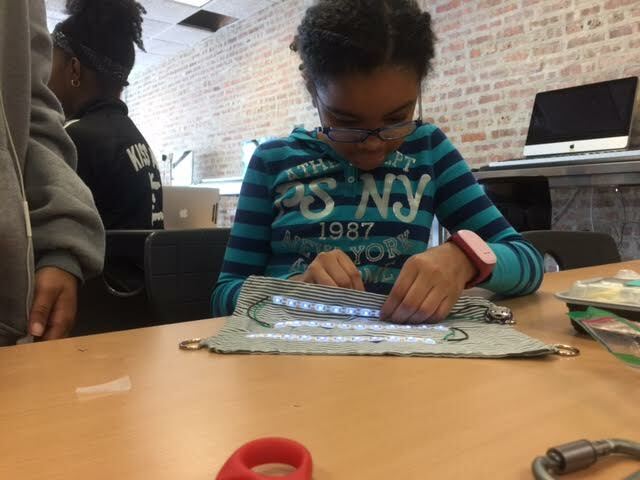 Maker Corps partner sites are youth-serving organizations, such as science centers, children’s museums, schools, libraries, and community organizations, dedicated to providing children with rich summer making experiences. Our partner sites include a diverse mix of organizations ranging from those who are brand new to making, to those who are leaders in the movement, and everything in between! 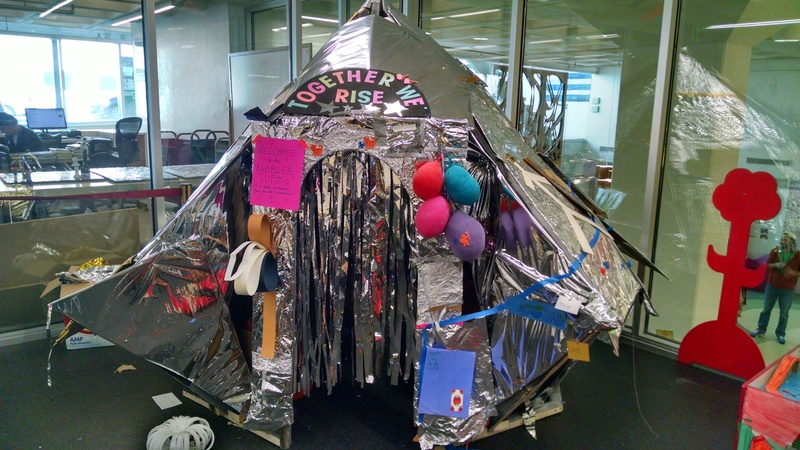 We asked our partner sites to tell you a little about themselves, and share the craziest/coolest/weirdest thing a young person has ever created in their space. Click on each organization’s name to see what they had to say. And make sure to check back as we continue to add more descriptions. The Arkansas Discovery Network was initiated in 2006 with funding from the Donald W. Reynolds Foundation. More than $14 million has been awarded from the Reynolds Foundation and other donors over the years to support our mission of making hands-on, interactive STEM experiences more accessible to K-12 students. In 2012 the Arkansas Discovery Network partnered with the Exploratorium and Science Museum of Minnesota to design and install The Tinkering Studio at the newly renovated Museum of Discovery in Little Rock, AR. The Tinkering Studio is a workshop for playful invention and exploration. Each month features a different activity or theme. Guests of all ages are invited to join our resident makers and educators to imagine and investigate. The space provides opportunities to be inspired and empowered by real materials, processes and tools. One of the coolest projects was when a girl in first grade came to the studio wanting to learn how headphones work. We dissected a pair of headphones and identified the key components. Then we built our own speaker using copper coil, neodymium magnets, and a paper cone. For further exploration, we tinkered with the components by using varying the size and gauge of the copper coil as well as the size and material of the cone, observing how these changes affected the sound produced. The Bakken Museum, located in Minneapolis, Minnesota, is dedicated to helping people find a passion for science and innovation and its potential for social good. My favorite place we do this is our Invention Programs. We have invention programs throughout the school year where students come in and work on their own project with the support of educators and volunteers. Our youth programs allow students to design and build their own inventions, work through creative problem solving challenges, make magic tricks, and play games. The primary goal of the week is for all the campers to make a project of their own design using the tools and materials from The Bakken’s student workshop, guided by mentors and educators. We like to say if you can think it, you can make it at The Bakken Museum! Probably the craziest thing a student has ever made in our workshop was a tesla coil capable of producing 6’ sparks. It took them almost a year to make, but it was super impressive once they got it working. Learn More. The Children’s Museum of Houston serves an audience of more than 1 million children and families. Average annual onsite attendance is approximately 800,000 with another 251,339 served through offsite outreach programming at 248 centers throughout the Houston area, in collaboration with 642 community partners. The mission is transforming communities through innovative, child-centered learning and our vision is to spark a passion for lifelong learning in all children. Our summer programming plans include creating various STEM based activities for our guests at the museum each month. We are also providing in-depth maker programming for the Girl Scouts of America with various workshops including upcycling, woodworking, coding, 3D printing, art and more! The weirdest creation made in our maker annex was a device to ring the sweat out of your socks, it even had a collection cup for sweat….gross! Learn more. Cincinnati Museum Center is a one-of-a-kind, multi-museum complex housed in Union Terminal, a historic Art Deco train station and National Historic landmark. Union Terminal is currently undergoing extensive repairs and restoration repairing the steel infrastructure, windows and limestone exterior as well as upgrading our HVAC and electrical systems and much more. Two of our three museums are currently closed due to these repairs, leaving our Duke Energy Children’s Museum and changing exhibits hall open. During this transition, we are opening a new exhibit in our children’s museum (this Friday!!) called KidSPACE (acronym for Science Play Art Creativity and Exploration). In this exhibit we will play with light and shadows, gears and tubes, paint and clay, circuits and LED’s, yarn and cardboard and much more. We will repurpose with purpose, build on each other’s ideas, all while being playful with materials and processes. This summer includes breaking in this exhibit and figuring out how to best serve our guests with these types of experiences. Lots of reflection and evaluation and trying new things! Our Maker Fellows will be integral to this process, and will get to help with 2 weeks of camp including Design, Build, Create and Amusement Park Science which will keep them busy helping our youngest makers! Learn more. MAKESHOP is an intergenerational, informal makerspace at Children’s Museum of Pittsburgh, open nearly every day from 10am-4:30pm to any visitor who wants to get hands-on and create or learn with us. This summer, we’re looking for passionate learners to help us in the museum, with our teacher professional development, at several community summer programs, and even at a transitional housing facility for youth who have aged out of the foster care system! There is always something weird, wacky, and wonderful going on — for example, this super sweet Spider Girl mask: Learn more. I’m at the Science Museum of Minnesota. My program – called Play Tinker Make – runs every Saturday with tabletop and large building activities throughout the galleries of our museum. We have a cadre of about 60 volunteers and two coordinators. The volunteers are in two teams so we do about 8-12 activities each Saturday. Our 2 Maker Corps Members’s have three core activities 1) R&D for new activities for our program, 2)doing outreach for other out of school programs 3)develop a personal research project that might be used in our programs but does not need to – We want them to focus on personal growth goals. We have thousands of people go through our program – last October – January we had a giant cardboard gallery, 3500 sq. ft filled with cardboard boxes and tools – groups of kids created a cardboard shanty that would last a couple days then be torn down and completely rebuilt – so I would say the creation of a cardboard town is currently the craziest thing made. Learn more. The Bubbler at Madison Public Library is more than a maker “space”! It’s a program that extends maker opportunities into all 9 MPL buildings, and this summer, all 15 Madison summer school sites, and next fall all 15 community centers across the city. We’re so excited for our Maker Corps team this summer that will help us broaden our reach, perfect our traveling maker kits, and polish off our assessment tools that help us capture all the learning through making that is happening in Madison this year. Our craziest thing as of last week is this amazing UFO fort (below) that is taking up 1/4 of the Bubbler space. Our current Artist in Residence, Lesley Numbers helped a group of kids construct it for a more imaginative take on Together We Rise! CreateSpace@MFL was launched in January 2014 as a pop-up makerspace & digital media lab in the Middletown Free Library located in the Philadelphia, PA suburbs. The project was funded through an LSTA Creation Grant awarded in the fall of 2013. Due to space limitations in the library, the space was designed to be portable so we can take our programs and tools out into the community or even set up in a small corner of the library. We are currently the only space of this kind that is open to the public in Delaware County.​ Our space houses everything from 3D printers, a carving machine, digital audio workstation, video recording equipment, sewing machines and more! Summer is always jammed packed with activities at the library. We will hold our third TechniGals Summer STEAM Camp, our fabulous teen volunteers will run a summer coding camp, and Minecraft in Real Life Club will return. This summer we will be working closely with the J. Lewis Crozer Library in nearby Chester to bring maker programs to the kids and teens of that community. Kids will connect via Skype and in-person working on projects and getting to know each other. We are excited to be a part of the Maker Corps program. The Millvale Community Library is located just across the Allegheny River from Pittsburgh, and has been offering maker programming since opening our doors in 2013. This summer we are offering a series of free summer camps for kids ages 5-13. The camps are based on topics varying from gardening to fashion, and we are really excited to explore what making can look like in lots of different contexts! One of the coolest things a Millvale Maker has ever made in our space is a stop motion about different types of dinosaurs featuring hand drawn herbivores and carnivores. Learn more. 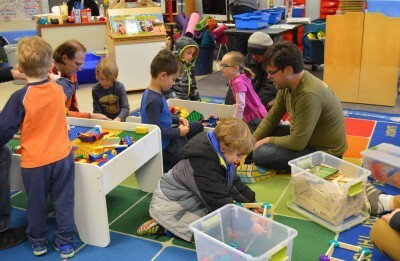 The Sharpsburg Community Library is a neighborhood branch of the Cooper-Siegel Community Library located in the suburbs of Pittsburgh, PA. After receiving a generous donation from the Women’s Board of Pittsburgh, we are excited to build our maker space and begin offering consistent STEAM programming for a variety of ages this summer! Learn more. The White Plains Public Library is a mid-size Library in White Plains, NY. This is a very diverse socio-economic city. The teen space, The Edge, is open to students between grades 7-12 after school and weekends. We have created a safe place for teens to come and hang out and do homework. We offer a wide range of programs and opportunities for them to experience new technologies like 3D printing, and VR, as well as learning about video production in our TV studio, sewing or participating in one of our community service projects. We have been Maker Camp affiliates the past 3 summers, we have also offered TV production camps, and other programming throughout the summers for teens to participate in. The craziest thing a teen has created is probably not appropriate for the website, but a teen used Roblox to create a digital replica of White Plains. Learn more. Inspire School of Arts and Sciences is a college-preparatory charter high school located in Northern California. The school has an enrollment of 450 students, is fully accredited by the Western Association of Schools and Colleges, is a Gold Ribbon School recognized by the State of California, and is an exemplary program recognized by the National Arts Schools Network. Inspire supports 12 major course sequences in the arts and sciences that go beyond a high school diploma and college admissions requirements. These areas are focused on the ways expression, design, critical thinking, planning, production, self-direction and collaboration play key roles in preparing students for careers that have not been created yet. As an organization, the mission of Inspire School of Arts and Sciences is to provide high levels of learning and support within a personalized environment that allows students to explore their interests and develop their talents. Craziest things a young person has created at our site? Too many to list, but here’s a couple. A student choreographed a dance that followed the patterns and algorithms of the Fibonacci sequence. Another student created a 12’x40’ mural with a panda riding a bike, a two-headed whale, a cello playing satyr, dancing silhouetted couple and more… it was even restored by the student after it was grossly tagged with graffiti. 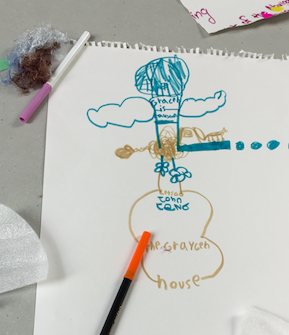 Design Den started with making and tinkering activities in an extra classroom at the Mayborn Museum in summer of 2016. We moved to a permanent exhibit space in October 2016. Since then, we have had monthly theme days and other special programs inviting our visitors to take part in all sorts of fun maker programming. This summer, we plan to offer drop-in activities for our visitors every weekday with the help of our Maker Corps Members and teen volunteers. Our Maker Corps Members will also help us start a new community outreach initiative by offering weekly maker programming at various community centers, libraries, and non-profits in the Waco area. The craziest thing that a young person has ever made in Design Den was a functioning bow and arrow made using only dowel rods and rubber bands! I am hoping to top that with all of our programming this summer! Learn more. The Digital Youth Network (DYN) sits within DePaul University’s College of Computing and Digital Media. We design learning systems that ensure all youth develop critical skills, increase their sense of agency, and have a shot at realizing their life potential. DYN shows what is possible in the lives of young people when you apply culturally grounded human-centered design to build learning systems that support the development of all youth, especially in the areas of design, coding and making. Just as important, DYN, through its research-based solutions that break down barriers between out-of-school and in-school, shows how it is possible. “Making” Movies course at the Little Black Pearl Art and Design Center. Duquesne University STAGES (Student Theater Arts Guiding Engagement & Success) brings teenagers living in the Greater Pittsburgh area to Duquesne University for a month-long theater arts summer camp. The camp, held in Duquesne’s Genesius Theater, is staffed by Duquesne University students, alumni, faculty and staff. Students explore the campus over the course of the month, and get a taste of college life. In July 2016, students were given a crash-course in theater arts, learning acting, script writing, hair/make-up, lights and sound. In just one month, they conceived, wrote, produced and performed seven one act plays. Learn more. In August of 2015, CSC opened the Fab Lab Carnegie Science Center, whose mission is to integrate STEM competencies into authentic making experiences. The Fab Lab is a digital fabrication facility where learners of all levels come to experience new technologies like 3D printers and laser cutters. In order to maximize educational opportunities to underserved youth, CSC has an on-site lab and 2 mobile Fab Labs. Fab Lab Education Facilitators deliver high quality STEM programming to over 5,000 students during the school year, and this summer will host two Maker Corps members at the stationary lab to run a 10 week summer program of awesome Maker Camps! Learn more. We help to develop talent and offer opportunities to diverse groups of life-long learners. We offer workshops, events, speakers series, and exhibitions & programming for youth and families. Fab Lab DC is also a resource for local, national, and international organizations. Fab Lab Nola inspires New Orleanians to become the next generation of innovators through hands-on learning, to cultivate a passion for math, science and digital fabrication. For the summer we will be working with Excite Allstars who is a city wide program for at low income students. We will focus on weekly skills for these students to culminate in a student-directed free build at the end of the summer. We will also be working the Delgado STEM summer camps, but those projects will focus more directly on instructor outcomes rather than free fabrication. The coolest thing a student has build in the lab was a self balancing robot for his school science fair. The student designed the chassis so it was adjustable and cut it out on the laser. He also modeled and printed the rims and wheels for the project. He ended up going to the state finals. Learn more. Assemble is an open, physical community space for arts and technology located in Garfield, in the East End of Pittsburgh. Assemble unites artists, technologists, and makers with our neighbors of all demographics and provides a platform for experiential learning, open creative processes, and building confidence through making. 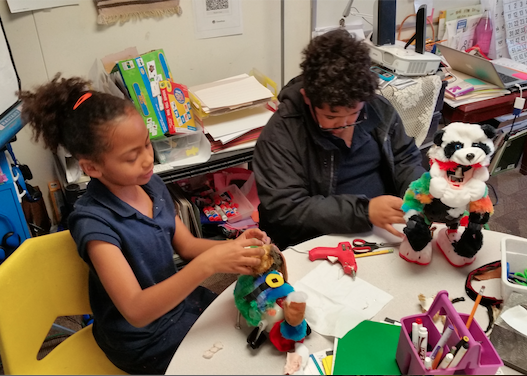 Through dedicated daily afterschool and summer programs, Assemble provides a space for children K-12 and adults to engage with Science, Technology, Engineering, Art, and Mathematics (STEAM)-based activities in a fun, relaxed environment. We provide a space for learning, community, and public art to improve the quality of life for Garfield residents. One of the craziest yet inspiring things a young person has made in our space was a glitter cannon. Lynniah, who has been coming to Assemble for over 4 years now, was inspired by what she was learning with tubes, balloons, waves, particles, and sound. She also LOVES glitter. (Still loves glitter.) In our old space, our glitter was tucked away but accessible if you were headed to the bathroom. During a Saturday Crafternoon program, she went in the back and took her engineering to a new level. With what she had learned from making instruments, she applied it to produce a GLITTER CANNON! This project has become infamous due to the amount of glitter that was distributed across our space. Lynniah did a great job. She also did learn that glitter can’t solve everything. We all needed to clean it up but did it together in the end. Learn more. DIY (“Do-It-Yourself”) Girls’ mission is to increase girls’ interest and success in technology, engineering and making through innovative educational experiences and mentor relationships. We’re a supportive community for girls driven by an interest in creating and building with technology. This summer, we plan on teaching our girls all about woodworking as we build our own vegetable planters and learn to cook healthy meals with the type of vegetables we will grow! The craziest thing anyone has built with DIY Girls is a solar powered shelter for homeless individuals in LA. The high school girls are still working on it, but it will be done by the summer! Learn more. We are a new STEAM/MAKER club in Albuquerque dedicated to helping children innovate and create by merging science, technology, mathematics, and art (STEAM). We aim to teach 21st century skills, as well as the basics of MAKING, through engaging hands on experiences. This summer we will give children the space and tools necessary to ask questions, get messy, and challenge themselves to explore their world, to make mistakes and to enjoy the process of tinkering. 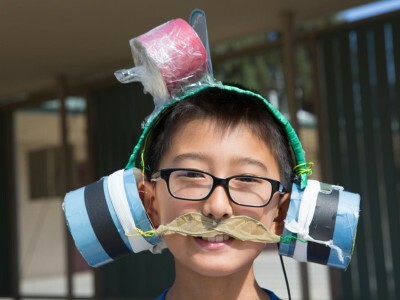 Each camp week will end with a bang on Friday with a fabulous mini-maker faire for parents and friends, where campers will exhibit several of their awesome inventions. The craziest things that have been made (so far) are these two franken-toys. We spent a few weeks taking apart technology, and then putting it back together again, this boy and his sister started the club a few weeks earlier, and got over their fears of making and tinkering (it took them 6 months to try the club). They win for the oddest things made so far. Our organization is a 4-H Technology Playground and Makerspace. We are family orientated with our main focus being children 5-18. We provide several maker mindset events and workshops throughout the year and open shop (free play) on a weekly basis. In addition to what we offer as a club (annual Robot and Technology Expo, Spokes, Maker Camp, CS First classes, robotics workshops, First Lego League teams, etc.) members are able to participate in 4-H activities as well. I’d have to say the coolest thing I remember is the stop motion animation video my then 9 year old daughter made with our maker corps member in 2015. I watched her plan, design, and produce the entire thing. She spent at least 2 full weeks of our 3 day maker camp working on that project. Learn more. The story of Sheboygan, WI is deeply rooted in an ethic of making. From manufacturing products to creating experiences, local children have an increasingly diverse economy to explore as they learn about themselves and make decisions about their futures. MAKER Break is designed to ignite exploration by bringing diverse children, tools, and experts together in facilitated workshops and open makerspaces throughout the city. MAKER Break is a collaboration between The Étude Group of schools and ARTery at The John Michael Kohler Arts Center. Drawing on a combined 60 years of experience in public arts programming, MAKER Break is committed to empowering all young people as creators and not consumers (and not just in the arts). Funding for our second year of free programming during breaks in the school year is generously provided by The Black Spring Foundation, Inc.
Last summer, MAKER Break participants used circuit bending techniques to reimagine old noise-making children’s toys as instruments and engaged in performative making for emergent theatre. This spring, our youngest participants are inventing solutions while making their thinking visible in side-by-side workshops with their parents! MakerHut is a creative community of makers in Zambia that explores projects and technology in the fields of electronics, crafts and industrial design. MakerHut aims to radically transform STEAM education in Southern Africa and inspire the next generation of youth to build an amazing future for Africa. Our summer program (though it will be winter in Zambia!) will focus on weekend classes in modules that incorporate electronics, programming and/or crafts for primary and secondary school students. In addition to some core modules, students can focus on sessions which interest them so by the end of the 12 weeks you might have either built your own robot, crafted a luminescent bracelet, made your first game or all of the above! We like to make projects that are useful and also projects that are simply creative and fun. The coolest and most useful thing someone has made is a power outage notifier that sends an SMS to you when the power is out at your home. As for the weirdest? Perhaps a collage made out of magnetic film from old floppy disks. Learn more. MetaMedia is a digital media lab and makerspace designed for middle-school youth at the McGaw YMCA in Evanston, IL. MetaMedia provides middle-school youth access to a free, safe, drop-in space where they can form mentoring relationships with compassionate adult instructors from diverse backgrounds, and use technology and digital media tools at no cost. MetaMedia intentionally reaches out to middle-school youth who are not already engaged after school or connected to STEAM resources. At MetaMedia, youth discover their passions through tinkering with computers, digital media, and fabrication tools. Youth choose how they navigate MetaMedia’s resources, and instructors design experiences around their shifting needs, interests, and levels of engagement. This open-ended learning environment and flexible, student-centered approach allow youth to hang out and build enduring relationships with peers and mentors while simultaneously pursuing deep projects. This summer, we will be running our MetaMedia Summer Experience (MSX) program, a 6-week invention and entrepreneurship camp where students work in teams to solve a community-based problem through digital fabrication and digital media. This program is run in partnership with our local school district and helps students develop traditional literacy skills as well as maker skills and mindsets. As for the craziest thing that has been made at MetaMedia? Currently, we are working with a student who wants to make a realistic squirrel puppet loaded with an Arduino mini camera so that he can capture close-up footage of squirrels like they do on the showSpy in the Wild. MindAfrica Leadership Initiative is a not-for-profit organization based in Nigeria. We organize enrichment programs for children and youth to stimulate their creative and innovative potential in ways that enable them become makers, creators, inventors and not just users. MindAfrica is leading the maker movement in our communities by organizing maker programs and makerspaces where children and youths can explore, make and share. 75% of our program beneficiaries are economically-disadvantaged children and youths. We love making! 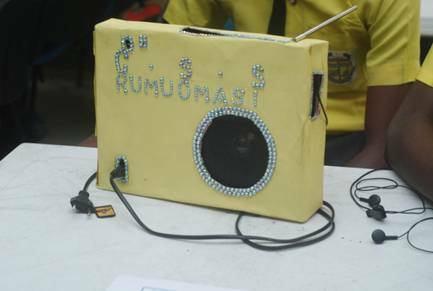 One of the ‘coolest’ things made in our programs recently was a “multifunctional radio set.” Made from cardboard paper and bits and pieces from faulty electrical appliances, this radio has a USB port for connecting phones and mobile devices, a memory card slot, and a jack for headsets. It receives signals from some local radio channels and also has rechargeable batteries to keep it powered. Co-op Camp in Mamaroneck has been partnering with Maker for the past 3 years, (last summer excluded). It has been a wonderful educational experience for all from campers to interns to teachers. Our work has included, circuitry, 3-d printing, cardboard construction, and recycled art construction. 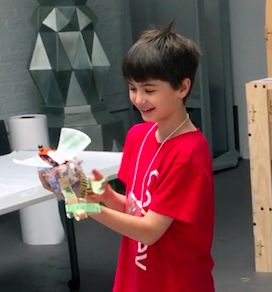 Some of the coolest pieces our campers came up with included, musical instruments, dancing with makey-makeys, making scratch video games, and creating furniture from recyclables, cardboard & duct tape. We also recreated an imaginative look at the town our camp is located, Mamaroneck, and recreated it out of cardboard, complete with roads, buildings, lights and harbor. This project was displayed at the Children’s Museum in Rye, NY. Storming Robots provides year-round robotics engineering and technology education with computer science as the core foundation for Grades 4 to 12. It is broken into three terms during school year, and one summer term. Our programs are broken into three tracks – Robotics Track, Algorithms Track (computer programming focus on computational and algorithms thinking), and Independent Project Track. We provide a learning roadmap to help students to grow with their interests and strengths. There are quite a few cool projects you can check out on our page. Learn more. T4T rescues cast-off materials from manufacturers and reimagines their uses for STEAM and maker education. To date, we’ve saved over 260 TONS from the landfill! We believe in project-based learning, where students of all ages build skills through the process of building, tinkering and creating. 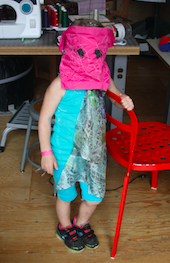 Our summer camp learners have made operable headphones we call “Beats by Me” using our upcycled materials. Elementary school students experienced how sound travels in electronics (a high school physics lesson) by reverse-engineering a pair of headphones, then crafting their own working version. In the summer, at the Thanksgiving Point Makerspace, we allow a shared space for our community for summer workshops and camps for students already involved in our Operation Inquiry program. Youth have the opportunity to become teen volunteers over the summer, and spend some of their time mentoring younger students and providing assistance in other STEM/Maker workshops and summer camps. So far this year, some of our most awesome projects have included: building a drivable couch, laser cutting an acrylic chess set, making dozens of electronic embroidery pieces, leather working, lathe work, competing in First Tech Challenge and Utah Underwater Robotics. Learn more.